We decided to bring up these wonderful dogs as if they were our children by giving them the same fondness, the same passion and especially the same complete and disinterested love. Our relationship is based on a sweet and affectionate bond and on mutual respect, which make them adorable. Our Bolognese dogs are excellent companions with an extraordinary vocation: to stay next to their master. They are joyful, lively and extremely intelligent dogs capable of interpreting and anticipating the wishes of their master. They are very fond of the family members and establish a relationship of loving complicity with them. They are eager to please the family and love being involved in family matters. The Bolognese therefore is the ideal dog for children and for old people: they are precious playmates and companions for driving away or relieving loneliness. 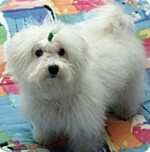 of the Cross to Rialto ", representing "the Bolognese"
The Bolognese: Italian breed of noble past…a small, white fluffy ball, aristocratic and elegant jewel of Italian dog breeding. 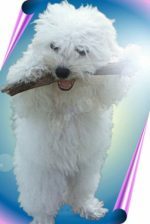 Small-sized and well proportioned dog, height measured at the withers varies in males between 27 and 30 cm, in females between 25 and 28 cm, weight varies between 2,5 and 4 kg. His coat is white and long along all the body. The Bolognese has an agile gait and carries himself proudly. 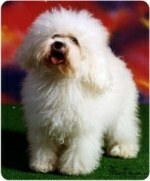 Creative temperament, sweet, intelligent, vigilant watcher, in love with whoever takes care of him. He is a true companion and at the same time a courageous guard dog. The Chiesanova kennel is a regular member of ENCI (National Italian Dog Association) that has awarded the kennel with the internationally acknowledged title "di Chiesanova".